First of all, Sakyamuni Buddha referred to the traveler as each and every one of us as human beings. It wasn’t only the Buddha who said it in this way. Many sages and wise men of old described life as a journey, and people as being travelers. Our life is like a journey. Last year’s journey has ended and this year’s journey has begun. When this year’s journey ends, next year’s journey will begin. So it continues. If a person is a traveler, there is something he must always bear in mind. It is the direction in which he must travel. In other words, he must know the destination of his journey. Likewise, we too must know the purpose of life. What is the objective of living? We call this the purpose of life, but people are not aware of this are travelers who travel without a definite destination. And that just doesn’t really make much sense. We were born alone in this world, so we will die alone. Our journey is all alone from beginning to end. Even though we may have company for our physical body, there is no company for our soul. No matter how many people you are surrounded by, there is still no one who can understand your soul completely. A vast wilderness represents the history of our True Self. This physical body will die within the span of a hundred years or so. However, Buddhism teaches that our life is eternal. Our physical body can be compared to a bubble on the surface of a great river. A bubble forms and disappears instantly, without even bothering the flow of the river. The white bones represent the death of our family, friends, acquaintances, and people we know. We are shocked whenever we see or hear about their deaths. That feeling of shock is referred to as having seen the white bones. It includes the panic or pain we feel when we observe natural disasters and tragedies on the news. Come to think of it… we have been trampling over such scattered bones – the deaths of others – for all these years. The huge, hungry tiger is compared to the Wind of Impermanence, or put simply – death. There is nothing in this world with shape that does not crumble. Therefore, the physical body of man will have to die one day. There is no means by which those that have been born can avoid death. Moreover, since death is the most fearful thing of all to human beings, it is compared to the hungry tiger. At the time of Buddha it was considered to be the most ferocious creature in India. The ferocious tiger is also known as the Tiger of Impermanence. It is stalking behind each one of us from the time we are born. Tonight might be the very night we’re bitten by it. 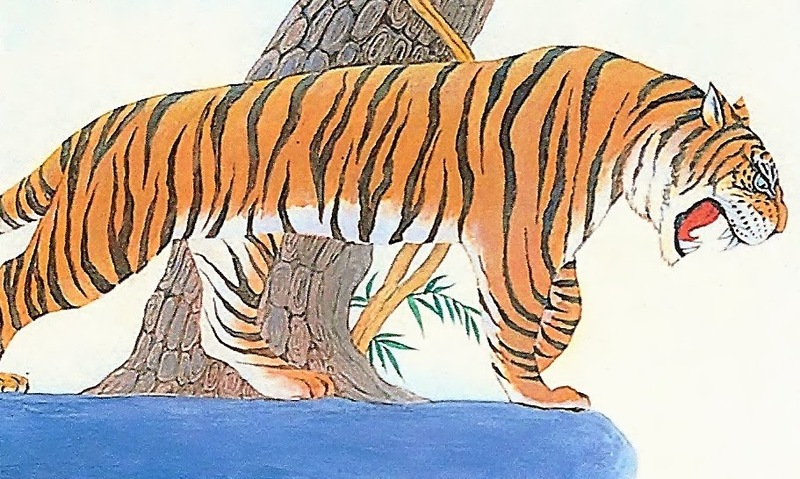 The man running away from the tiger in this parable shows how hard we try to escape death by running to the doctor or taking various herbal remedies when we get sick. As a result of such precautions, the average human life span has increased. Many years ago it was 50. Today it is roughly about 80 years. It is possible to prolong life to a certain extent, but there is no way of escaping death. 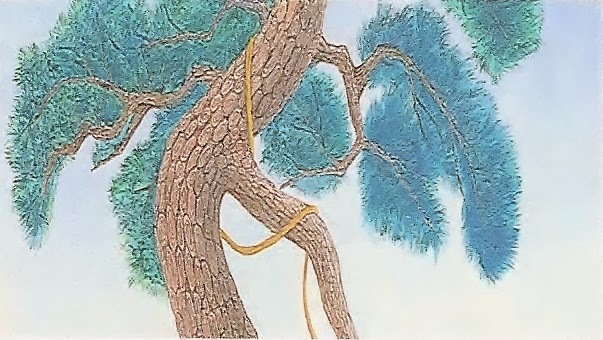 The things we rely on daily – money, wealth, fame, position – are compared to the pine tree. No matter how many of these things we may possess, we cannot escape from reaching the grasp of the Tiger of Impermanence. No matter how much material wealth you have, it cannot shield you from dying. What is the significance of the wisteria vine, to which the traveler was hanging to? The wisteria vine is compared to our lifespan. If you hear that “all living things die,” you will agree with it at once. Deep in your mind though, you are still counting the time you have left. “I’m not going to die for another ten or 20 years,” you may say. But it’s shorter than you think. For evidence, recall your past ten years. Were they long… or were they short? They must have gone by before you knew it. If that is so, the next ten years will be just as short. Also a wisteria vine is very thin and brittle, and so are our lives. We think our vines are strong like an iron cable, but it can snap on us in just an instant. Even still, we just refuse to accept this idea. 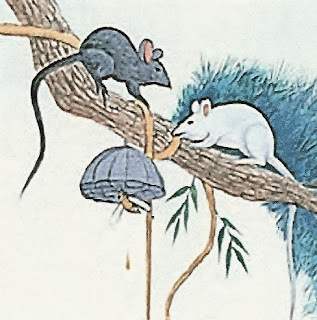 The two mice represent day and night. Day is bright, so it is the white mouse. Night is dark, so it is the black mouse. Day and night are taking turns shortening our lives. To have lived one day today means we went one step forward to the day of our death. Death plays no favorites. Whether it is at a wedding or on a New Year’s Day, the mice keep on chewing and the vine is bound to be cut eventually. That very moment is death… the end of one’s journey. So what happens when one dies? Find out more about the role of the afterlife in the next post on the Reality of Mankind series. You can learn about the meaning behind the symbols of the bottomless blue ocean, the three dragons, and the drops of honey.